UPDATE: You can now Subscribe on iTunes to This Week In Chiptune’s Podcast, the full shows downloaded right to iTunes! 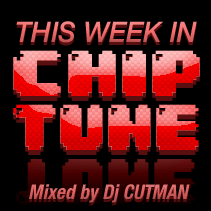 It’s not exactly Radio, Dj CUTMAN has been using the streaming DJ site Mixify to host a live show each week highlighting new music in the chiptune world. There’s been two episodes so far, and while a regular day of the week hasn’t been decided on for the show, the future seems bright for this as a series.